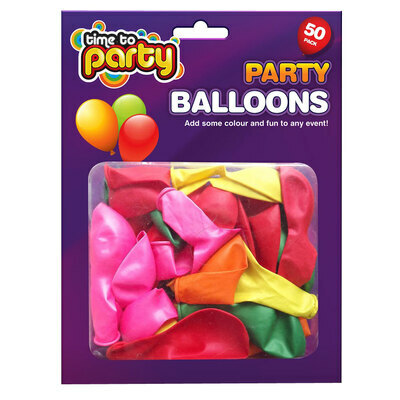 Wether you're throwing the party of the year or simply introducing a new tool to your sensory kit, our Balloons Assorted 50 Pack are a highly economical choice for all manner of work environments. Designed to include a wide range of colours, this large pack of 50 balloons each come in the traditional rounded shape and can be blown up using either helium or air. Hang from bunting to create a haven of party fun or simply pass round to the children of your class to allow discovery of a new texture. Designed to be durable enough for gentle play and bright in colour to capture everyone's attention, this sufficient pack will easily fill a room accordingly without overpowering the rest of your party. If it's a party time, Gompels also stock our Table Cover to keep furniture protected while the cakes and sausage rolls are being devoured. Our range of Tableware and Napkins will come in handy when searching for economical and well-priced options for larger parties.